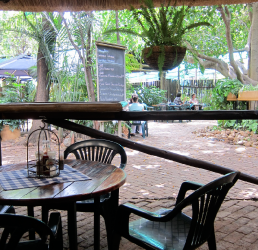 Sanitas boasts a beautiful, lush green Tea Garden which is covered by WiFi. Our staff will greet you with a smile and you can get away from it all in this relaxing atmosphere. Come and enjoy a delicious meal made with love and care. We offer a variety of breakfasts, lunches, light meals, desserts, cakes, milkshakes, teas, great cappuccinos and coffees. When in season we use our own homegrown fruit, vegetables and herbs in our meals. Make sure to try our homemade Gelato (Italian Style Ice Cream) and our famous homegrown Lemonade. 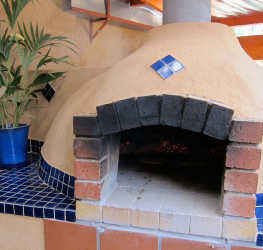 We now also have a wood fired oven in which we prepare the most delicious thin based pizzas. In season we serve our homegrown strawberries, mango treats and freshly pressed juices, such as naartjie. For the kids we have a large jungle gym and sand pit shaded under large trees and established Palms. A great haven for children! Linked to the tea garden at Sanitas is our multipurpose training venue @Linnaeus. When we are not using this venue ourselves, it is available for workshops, conferences etc. It’s also a great venue for art exhibitions.